Attic encapsulated with a clear sealant. Mold sealant is a paint-like substance designed to seal a moldy surface from which the mold cannot be fully removed, like wood. 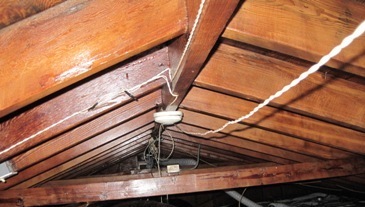 Encapsulating mold in this way is generally only done when the moldy material cannot be removed and replaced. Most of the time, it’s better to remove the moldy material if it cannot be adequately cleaned. Sealant resembles paint (or it can be clear as in the picture above) and it can be applied with a paint brush, paint roller or sprayer. However, unlike regular paint, it contains antimicrobial ingredients that help fight mold. It also seals in any mold remaining on a material, like wood, so that it cannot continue to grow and spread. This process is known as encapsulation. It’s important to understand that regular paint will not have the same effect. It will just cover up any remaining mold, making it more difficult to see the mold when it begins to grow and spread. It will make the situation worse in the long run. You can purchase mold sealants for encapsulation at many home improvement stores. Mold remediation experts recommend products like Foster 40-50, which is available on Amazon.com. It’s important to read and follow all directions carefully when using these kinds of products to ensure they work properly and for safety’s sake. To be safe, you’ll need safety gear, including disposable gloves and an N-95 respirator mask (also available at many home improvement stores), when applying a sealant to moldy materials. When is Encapsulating Mold Necessary? It is impossible to remove mold completely from some porous and semi-porous materials, including wood, drywall, ceiling tiles, carpeting, and fabrics. When performing mold remediation, these materials are usually removed from the home, discarded, and replaced with new materials. Occasionally, though, it is extremely difficult or impossible to remove a material that is contaminated by mold. For instance, drywall and insulation can usually be easily removed and replaced, but the wooden studs inside a wall are another matter. In such cases, as much mold as possible is removed from the surface of the wood (sometimes by sanding the wood), the wood is cleaned as thoroughly as possible with a microbial product like Foster 40-80, then treated with a mold sealant. There are some risks involved with the process. In order to remove as much mold from the surface as possible, wooden surfaces may be sanded. However, sanding moldy wood sends hundreds or thousands of tiny mold spores into the air, where they are easily inhaled. Strict safety precautions must be taken to prevent breathing in mold spores, which can lead to all sorts of respiratory problems and other illnesses. For this reason, only mold removal professionals should sand moldy surfaces. If surfaces don’t need to be sanded, homeowners can just clean them thoroughly and then apply a mold sealant. If you have materials from which it is difficult to remove mold and you think encapsulating the mold might be the answer, we recommend consulting a mold removal professional first. You may need to have a professional handle the job, but even if you decide to do the work yourself, you can get valuable advice from an experienced professional. Most mold removal professionals offer free consultations, so you can get some expert advice at no cost to you. To find experienced mold removal professionals offering free consultations near you, just follow the link. For information about performing all aspects of mold remediation, including encapsulation, yourself, we recommend the ebook A Homeowner’s Complete Guide to Mold Remediation by Brian Turner. An expert in mold remediation, Mr. Turner provides comprehensive instructions on how to encapsulate mold, along with guidelines regarding when to encapsulate mold and when it is inadvisable to do so.